GOP Candidates Wrangle Over Reagan's Legacy As he campaigns for the Republican nomination, Newt Gingrich almost always works the name of Ronald Reagan into his speeches. In fact, Gingrich's name-dropping is so common that it's now being criticized by Mitt Romney and the superPAC that backs him. President Ronald Reagan rides his horse at his Rancho del Cielo, "Ranch in the Sky," located outside Santa Barbara, Calif., in April 1985. Sometimes he invokes Reagan's name as an inspiration. "Because I was involved in that period and because I lived through it, I will confess to you, I am channeling Ronald Reagan in 1975 and '76, and I am channeling the way that he used the Panama Canal and the fact that he didn't back down. He lost five straight primaries and he didn't quit for a day," Gingrich said a few days later in Central Florida. Sometimes Gingrich claims to be Reagan's political heir. "In 1995, at the Goldwater Institute, Nancy Reagan said that Ronald Reagan's torch had been passed to me as speaker of the House, and I was carrying out the values that he believed in," said Gingrich. Then a congressman from Georgia, Newt Gingrich laughs at a joke told by President Reagan in Atlanta in 1984. And he's more or less right. The former first lady actually did mention Gingrich after Republicans won a majority in the House and elected Gingrich as their speaker after the 1994 elections. "Barry Goldwater handed the torch to Ronnie, and in turn Ronnie turned that torch over to Newt and the Republican members of Congress to keep that dream alive," she said. And, in fact, Gingrich has been endorsed by Michael Reagan, the president's son, who said Gingrich exemplifies the conservative principles his father championed. But Gingrich's relationship with Ronald Reagan was a bit more complicated. He was a back-bencher in Congress when Reagan was in the White House. And he wasn't always supportive of the then-president. Writing in the National Review online, former Assistant Secretary of State Elliott Abrams recalls Gingrich criticizing Reagan's policy in Afghanistan, saying it was marked by "impotence and incompetence." In a conference call arranged by the Romney campaign Friday, Dov Zakheim, a former Defense Department official in the Reagan administration, dismissed Gingrich. Who's Closer To Reagan On The Issues? 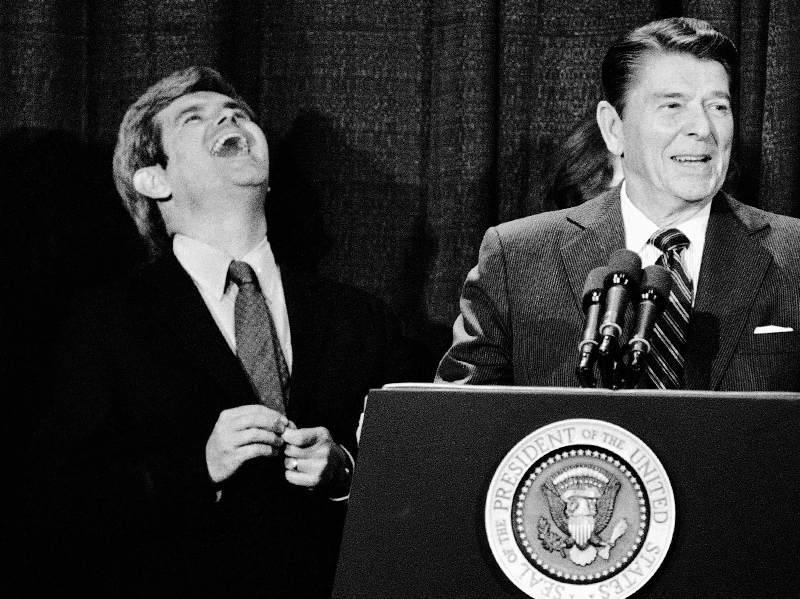 Newt Gingrich and Mitt Romney have been squabbling over who's closer to Ronald Reagan. Here's a look at how their positions square with those of the Gipper on two key issues. In 1986, Ronald Reagan signed the Immigration Reform and Control Act, which called for tighter security at the Mexican border. It also granted amnesty for 3 million illegal immigrants. As Reagan put it in 1984: "I believe in the idea of amnesty for those who have put down roots and lived here." Newt Gingrich used similar terms in a GOP presidential debate last year, saying the U.S. should not "uproot" families who have lived in the U.S. illegally for several decades. Mitt Romney has repeatedly said he's against amnesty, saying illegal immigrants "should not be allowed to stay in this country and be given permanent residency or citizenship merely because they've come here illegally." In recent weeks, he's also raised the idea of "self-deportation" for people currently living in the U.S. illegally. For conservatives, Reagan's legacy is closely tied to his attempts to cut taxes and spending. During his presidency, he cut the top income tax rate to 28 percent, a figure reiterated in current GOP presidential debates. In 1982, then-Rep. Newt Gingrich criticized Reagan for "trying to score a touchdown for liberalism" by supporting tax increases. On the campaign trail, Gingrich has attempted to closely align himself with Reagan's tax policy, saying recently at a rally, "The Reagan-Gingrich model is lower taxes." 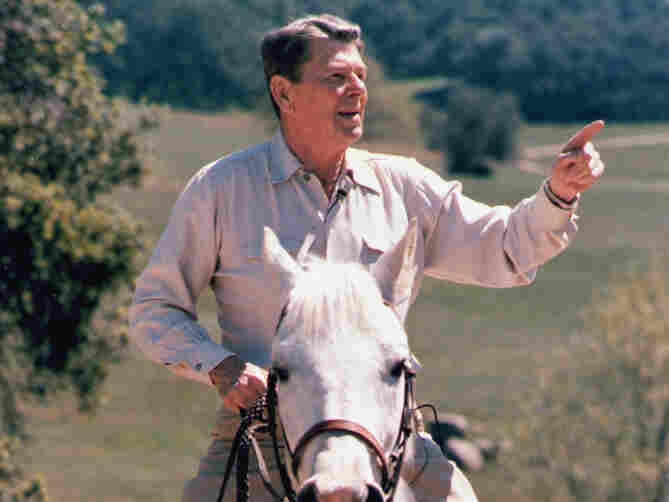 Mitt Romney's tax plan echoes Reagan's call for a broader tax base and eliminating loopholes. "He just wasn't a factor other than a sort of gadfly who criticized Mr. Reagan on occasion. But if you read the memoirs of Cap Weinberger or George Shultz, you won't even see Newt Gingrich's name mentioned at all. He simply was not a major factor," said Zakheim. Mitt Romney has also directly questioned Gingrich's ties with Reagan. "I looked at the Reagan diary. You're mentioned once in Ronald Reagan's diary. And in the diary, he says you had an idea in a meeting of young congressmen, and it wasn't a very good idea, and he dismissed it. That's the entire mention," Romney said at a recent debate. Restore our Future, the superPAC backing Romney, put out an ad making much the same charge, that "Reagan rejected Gingrich's ideas." In response, at Thursday's debate, Gingrich pointed to Romney's unsuccessful 1994 run for the Senate and how Romney then distanced himself from the Reagan era. "In '94, running against Teddy Kennedy, he said flatly, 'I don't want to go back to the Reagan-Bush era. I was an independent,' " Gingrich said. There are several ironies about all this back and forth. In the battle over Reagan's legacy, both Gingrich and Romney forget the 11th commandment, popularized by the former president: "Thou shalt not attack a fellow Republican." And while Reagan remains a touchstone for older Republicans, for young voters this is a squabble over a figure familiar only from history books and perhaps grainy YouTube videos.